Hot sauce. 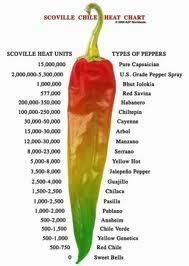 Hot peppers. Dry chilis. Combinations of all of above. Why do we like spicy food? We could go through all the physiological reasons, conduct physch tests, etc etc, but in the end, like any other food, it’s because it tastes good. It tastes great. But not all spice is good. Or good for you. It’s easy to over do it. Anyone can make really spicy food: just add heat. The key is balance. Balance, there it is again. You can make anything as hot as you can image, as long as it’s balanced on the other end. Usually the balance is sweet. I think, for the most part, a lot of the foods in our diets are salty, sweet and at times bland. We need the heat to balance. We pour Tabasco over our rich and salty foods. Like eggs, Mexican fast food, hashes, mac and cheese, and so on. It cuts the richness, and adds that desirable quality. Going in reverse is trickier. Start with heat, and balance it without the fat and salt. Then the focus is flavor and balance. This recipe is focused on 3 sweet things: shrimp, sugar and garlic. Oranges serve as an acid, and the Chinese flavors seem to fit the entire dish. Dry habanero peppers are deadly spicy, but as you will see, balanced, they compliment a dish perfectly and help bring out other, more savory flavors, that may otherwise be too subtle. In a heavy skillet, toast the habanero and coriander seeds together. Put the chilis and coriander in a spice grinder and grind to powder. Add the sugar, 5 spice, corn starch and salt and pulse until well incorporated. In a mixing bowl, mix the shrimp well with the dry spice. In a heavy bottom sauce pan, begin caramelizing the garlic over med-low heat. You want to garlic to be very sweet, but not toasted, no color. When the garlic is sweet, add the shrimp and turn heat to mid-high. When shrimp begins to show slight signs of pink, add the brandy, flambe (carefully) and reduce by 1/2. Squeeze the juice from the oranges directly into the pan and reduce by 3/4. Add the snow peas and cook for about 1 minute (they should still be al dente). Turn heat off and swirl in the butter. Serve right away. I like to serve this over steamed rice.